If you’re big into tweaking hardware… OCCT is for you then. 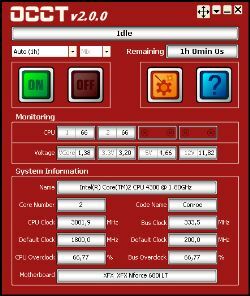 This piece of freeware for Windows allows you to check on some very important things like watching the heat from your cpu and ram, and also doing some more extensive testing of them. You can also generate some easy to read graphs and it uses a common plugin interface to watch Speedfan, and some other tools. It might not look like much, but believe me when I say that when you overclock, you’ll almost definitely need to use a tool like OCCT. Definitely. So stop the presses and give it a go. You won’t be disappointed.